Following an outstanding college career that culminated in his finishing second in the Heisman Trophy voting in 1970, Manning was taken by the Saints in the first round (second overall) of the ’71 NFL draft. 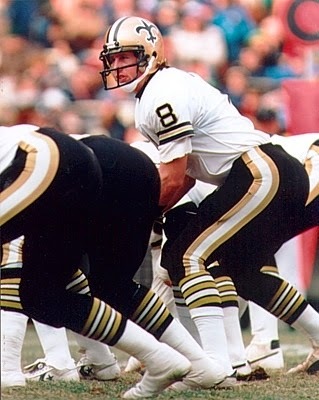 With a strong arm and excellent mobility, he was moved directly into the starting lineup and led the Saints to an upset win over the Rams in his first game, but the team was mediocre and he suffered through far more defeats than victories. He was sacked a league-leading 40 times and missed two games due to assorted injuries. Manning led the NFL in pass attempts (448) and completions (230) in 1972, but again in being sacked (43). Over the next few years, there were more low than high points and injuries were factors again in ensuing seasons. Manning missed all of 1976 due to a shoulder injury that required surgery and put his career in jeopardy. He came back in ’77 to tie for fourth in the NFC in passing, although an ankle injury again cut his season short. Saints went 7-9 to finish third in the NFC West, the franchise’s best record at the time. Manning followed up with another Pro Bowl year in 1979, completing 60 percent of his passes for 3169 yards and 15 touchdowns, although also 20 interceptions, as the Saints reached .500 for the first time in franchise history at 8-8. However, greater expectations for 1980 were dashed as the club dropped to a dismal 1-15, although Manning achieved career highs with 3716 passing yards, 23 TDs, and an 81.8 passer rating. His performance dropped off significantly in an injury-filled ’81 season and, losing his starting job to Ken Stabler, he was dealt to the Houston Oilers early in the 1982 season. He was traded again during the following year, to Minnesota, where he finished his career as a backup in 1984. Overall, Manning threw for 23,911 yards (21,734 with the Saints) with 125 touchdowns (all but ten with New Orleans) and 173 interceptions. He also rushed for 2197 yards and 18 TDs, averaging 5.7 yards per carry. While Manning played for losing teams and never fully met expectations as a pro, his sons Peyton and Eli went on to become noteworthy pro quarterbacks.